EA WorldView - Archives: August 2010 - UPDATED Iran Special: Have Ahmadinejad and Ali Larijani Kissed and Made Up? UPDATED Iran Special: Have Ahmadinejad and Ali Larijani Kissed and Made Up? The Islamic Republic of Iran News Network is loudly featuring the "co-operation" proclaimed at yesterday's Larijani-Ahmadinejad press conference. At the same time, Iranian media are highlighting the appointment of Ahmadinejad Chief of Staff Esfandiar Rahim-Mashai as special representative for the Middle East, while largely ignoring the other three special representatives who were named. There has no mention of the suspension of Saeed Mortazavi as a Presidential aide, apart from the opposition site Rah-e-Sabz. Media in Iran continue to say only that three officials have been removed from their posts because of alleged complicity in the Kahrizak Prison abuses. UPDATE 0930 GMT: We have rounded up the developments around the Ahmadinejad-Larijani press conference, assessing whether they point to co-operation or further tension, in our LiveBlog at 0650 GMT. 1. 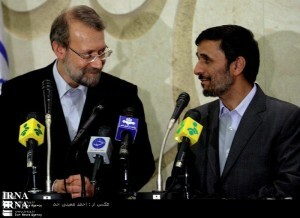 President Mahmoud Ahmadinejad and Speaker of Parliament Ali Larijani, after a formal meeting between the Government and the Parliament, hold a joint press conference in which they stress the need for co-operation between the Presidency, the Majlis, and the judiciary to address Iran's internal problems. 2. Saeed Mortazavi, who was Tehran Prosecutor General during the 2009 election and until the autumn, who found refuge under pressure as an aide to Ahmadinejad, has been suspended from his post --- along with two judges --- for his alleged role in the post-election abuses at Kahrizak Prison. 3. On Wednesday, after months of tension between the heads of his three Government branches, the Supreme Leader met with Ali Larijani, Ahmadinejad, and head of judiciary Sadegh Larijani. The Supreme Leader tells his three politicians that enough is enough. The factional quarrels within the establishment are preventing a common front at a time when Iran faces serious economic problems, in part because of sanctions, and the decision whether to proceed with talks --- including with Washington --- on the nuclear programme. But both Larijanis, apart from any personal rivalry and difficulties with the President, have a long set of grievances against Ahmadinejad's men going back to last summer. There have been accusations of economic mismanagement, corruption, mis-handling of the post-election crisis, and complicity in the abuse and killing of detainees. It's not going to be possible to address all those issues, even with the Supreme Leader as the mediator, at a single session. So a sign is needed. A sign that can come through a sacrifice of one of the President's men, someone who symbolises the problems caused by the Government's own mis-steps. Three nominees for Fall Guy spring to mind. There is Ahmadinejad's Chief of Staff Esfandiar Rahim-Mashai, who has brought some serious dislike upon his head with his statements, his protection from his brother-in-law (M. Ahmadinejad), and his accumulation of posts with both nominal and very real influence and control of money. He has already been at the centre of a dispute between the President and the Supreme Leader, which ended last summer from his step-down from 1st Vice President only to become Ahmadinejad's top aide weeks later. There's current 1st Vice President Mohammad Reza Rahimi, who is suspected by many conservatives of involvement with suspect financial schemes, including the Fatemi Street insurance fraud. Rahimi has also played Foreign Policy Expert with some curious statements in recent weeks and succeeded only in unsettling Iran's diplomacy, as well as looking a bit of a fool. And there's Mortazavi, who is blamed by key conservatives for the Kahrizak debacle, which in turn is a symbol for the sprawling system of detention and alleged abuse that has continued long past the summer of 2009. One of those who died in Kahrizak was the son of the campaign manager, Abdulhossein Ruholamini, of the 2009 election bid of Mohsen Rezaei, former head of the Revolutionary Guard and current Secretary of the Expediency Council. Rahim-Mashai, because of personal ties, his accumulation of influence, and his symbolic position as Presidential right-hand-man, is still too important for Ahmadinejad to let go of him. The departure of Rahimi, despite the dislike he has provoked and the seriousness of the corruption charges, might not have enough political significance to make an impact. So Mortazavi was tapped on the shoulder, the sacrifice that brings a respite in the squabble between Ali Larijani and Ahmadinejad, Parliament and Government. But is that a long-term lull? And is more of a public show at a time when Iran's international opponents as well as the supposedly-dead opposition movement are drawing conclusions from the rifts within the establishment? Let's go with "temporary" respite. And let's watch to see if Mortazavi is only the first Fall Guy. Football is actually 1 of the biggest sports in America. It has a big following.